Delaware has happy feet and it has the shoes to prove it. 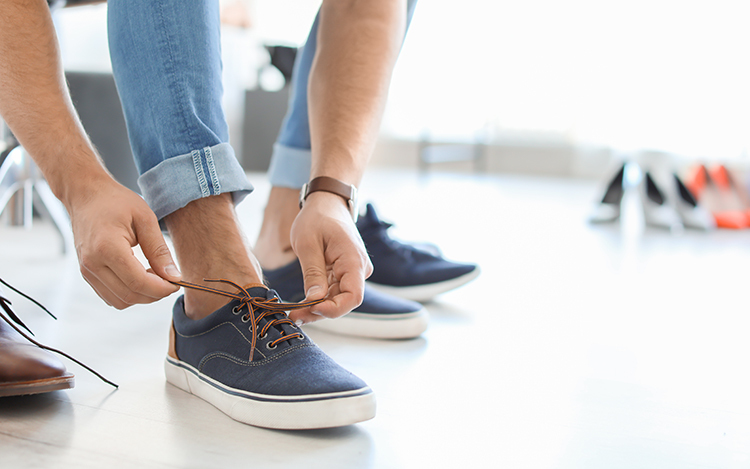 The great local shoe stores of Delaware feature excellent customer service, half-sizes, and custom fittings—things you just can't find anywhere. Moreover, you will find dance shoes, running shoes, narrow sizes, designer flip flops, comfort shoes, and even high-quality work boots. If you're in the market for a new pair, check out these great Delaware shoe stores. Owned by Jason and Joy Hunt, this local, family-owned-and-operated shoe store sells high-quality footwear and apparel to satisfy the entire family. From shoes for soccer players and distance runners to casual footwear, Elite Feet specializes in name brand shoes for all athletes. Plus, with a knowledgeable and friendly staff, this store will help you find new kicks for toddlers, teens, and adults. Helping you to meet your wellness and health goals through running, the Delaware Running Co. was established in 2002 to enhance the community by providing quality running and walking gear. Running and walking means staying fit, and DRC wants to make sure you are safe and comfortable while you are doing it. Plus, the store is locally-owned-and-operated by runners for runners. With over 200 brands of footwear, accessories, and apparel, Vernon Powell Shoes has everything to meet your family’s needs. Established in 1936, there are locations in both Delaware and Maryland. Vernon Powell prides itself in providing an impressive selection of shoes at reasonable prices. Plus, you will find brands like New Balance, Asics, Saucony, Sperry, Rockport, Clarks, and more. SAS has made a science out of designing comfortable shoes, while their footwear is hand-crafted and manufactured in the USA. Plus, most shoes come in half sizes, as well as slim and wide-wide. Moreover, their qualified staff will ensure a personal fit, and most footwear is even podiatrists-recommended for people with diabetes, hammertoe, and foot or back pain. Now, as far a big name shoe outlets, the First State has plenty to choose from—New Balance, Nike, Clark’s, Asics, Red Wing, Sketchers, and more—but there’s only one brand you can wear for a night out on the town or a day on the beach. All Crocs shoes feature their Croslite molded foam material, making this footwear light-weight, durable, and so comfortable that you might forget that you are even wearing them. Jay & El Shoes was started in 1956 in Columbus, New Jersey and customers reportedly flocked to the store based on its reputation of low prices and high-quality work boots. Then, in 1987, the store moved from New Jersey to the New Castle Farmer’s Market, much to the delight of Delawareans, and it currently offers biker boots, work boots, slippers, moccasins, cold weather shoes, and more. Offering superior service and shoes tailored to fit your feet, Just Comfort Shoes offers footwear from only premium shoe manufacturers like Birkenstock, Dansko, Keen, and Vibram FiveFingers. Plus, you will find clogs, sandals, and shoes for children, sizing and fitting tips, shoe care recommendations, and repair advice. Flip Flop Shops specializes exclusively in the "hottest brands and latest styles of flip flops and casual footwear" and was founded in 2004. You are invited to “Free Your Toes” and reduce your stress levels as you help to raise awareness along with the American Heart Association. This flip flop company was so wildly successful that it began franchising in 2008 and now operates shops around the world. This shoe store is the sneaker fiend’s dream. An official storefront was opened in 2018 after receiving much success through the online store. Find new or used Air Jordan’s, Adidas Yeezy’s, Nike Foamposite’s, and many more rare finds. Not only does TheKikBack offer an unbeatable selection of sneakers, but they offer shoe cleaning services and options to sell or trade your shoes. Be a part of this business’s growing success and check out what sneaker fanatics in Delaware are raving about! With over 20 years in sales experience and over 30 years in road racing experience, the owners of R.B.R.C. have the art of running down to a science. Specializing in triathlons and marathons, this store is the ideal spot to get customized shoes, gel inserts, clothes, and much more to help emphasize your running experience. People note their customer service as the best around; once you step through the doors and into their world of triathlon expertise, you’ll realize why they are the place to go for an all-around great shopping experience.